Thank you for using Telerik RadDatePicker and RadTimePicker! RadDatePicker and RadTimePicker are controls entirely consistent with the new Windows Runtime guidelines that allow users to select date and time much faster and easier. These controls expose three elements each. RadDatePicker exposes elements for selecting month, day and year while RadTimePicker exposes elements for selecting hour, minute and time part. The design of these controls allows users to navigate through the elements with infinite looping which makes these controls easy to use. It is appropriate to use these controls in any application that needs scheduling. 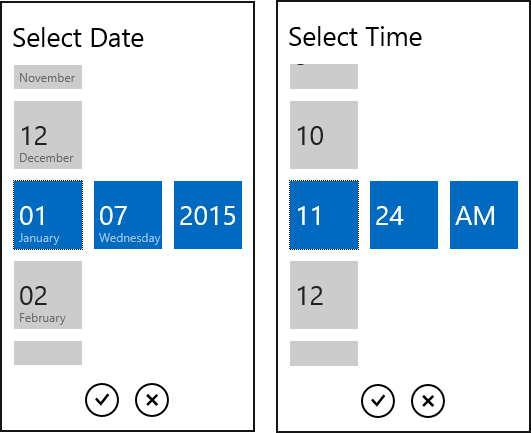 If a user clicks on the RadDatePicker or RadTimePicker, they will see the Date/Time Selector Popup appear.